Summary: A 15-year-old girl and her parents are walking through a hospital on their way to a doctor’s visit to learn if she is cancer-free or not. As they go, she remembers everything that has happened in the five years since she was diagnosed with leukemia. Her friend and hospital roommate Maxine died. She has met and fallen in love with a boy named Victor. She talks about her relationships with family members–how frustrated she has gotten when her mother calls her strong when she feels weak, and how she feels bad that she has gotten more attention than her younger sister. Finally, they get to the doctor’s office. 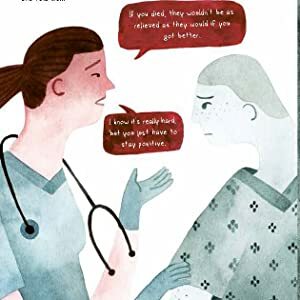 The reader doesn’t hear what the doctor says, only the family members’ reactions–the girl and her mother cry, while her father pats her on the shoulder, unable to express his emotions. It’s only when she gets outside and sees Victor waiting that she tells him and the rest of us the good news: “I’m cured!” Includes an author’s note about the girl who inspired this story. 96 pages; grades 6-9. Pros: This illustrated/graphic book is a quick but powerful read. Despite the spoiler title, you’ll still feel the anxiety of the family as they await the doctor. 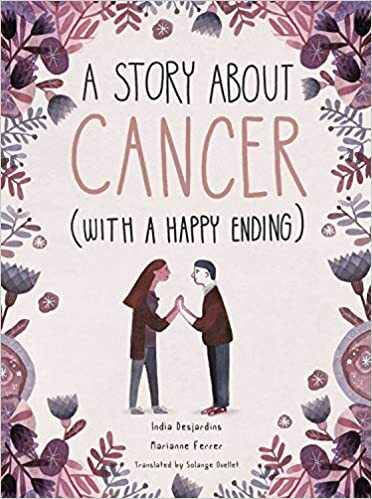 Cancer patients and their friends and families will benefit from hearing the perspective of a girl who has been through treatment and encouraged by her happy ending. Cons: I wasn’t a big fan of the somewhat surreal illustration style.